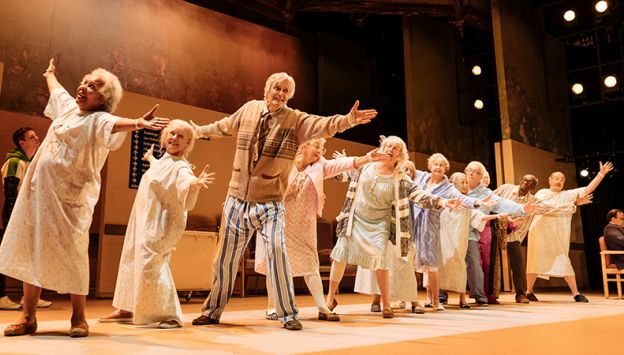 Alan Bennett’s sharp and hilarious new play is ‘just what the doctor ordered’ (Daily Telegraph). Filmed live at London’s Bridge Theatre during its limited run, don’t miss this acclaimed production full of ‘singalongs and stinging wit’ (Guardian). The Beth, an old fashioned cradle-to-grave hospital serving a town in Yorkshire, is threatened with closure as part of an efficiency drive. A documentary crew, eager to capture its fight for survival, follows the daily struggle to find beds on the Dusty Springfield Geriatric Ward, and the triumphs of the old people’s choir. One of Britain’s most celebrated writers, Alan Bennett’s plays include The History Boys, The Lady in the Van and The Madness of George III, all of which were also seen on film. Allelujah! is his tenth collaboration with award-winning director Nicholas Hytner.